This week Medicare released its latest eMedicare tool and it’s one any person can use on their mobile device. The app provides information limited to Original Medicare (not Medicare Part C/Advantage Plans) allowing those persons to query if Medicare covers a specific medical item or service. 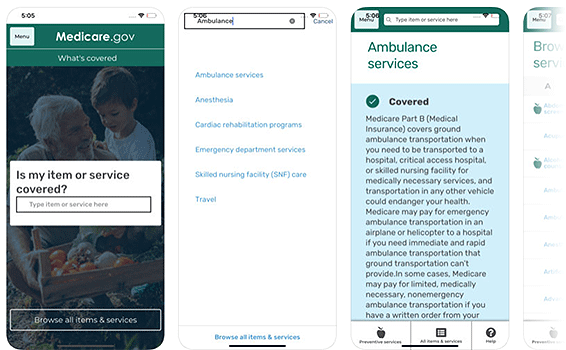 CMS touts the app as giving Original Medicare beneficiaries, their caregivers and other interested persons the ability to learn if an item or service will be covered on-the-go, such as in a service provider’s office, in the hospital and by extension even when in the ambulance. Anywhere your mobile device works, the new app is a person’s companion piece for understanding Original Medicare coverage. We easily downloaded “What’s Covered” to a smartphone in about a minute. The app is available on both the Apple and Android app stores and can be found by typing “What’s Covered” in the app store search area. The app’s icon is a letter “M” graphic with a check mark comprising the right half of the middle part of the letter with the word Medicare written just below. Of course, the “What’s Covered” app is free. “Is my item or service covered? …followed by instructions to type in the item or service into a search box. We tested it by typing just a few letters of the word ambulance and a link to Ambulance Services popped onto the screen almost immediately. We then tapped on the link, text noting that ambulance services are covered first appeared on the screen. Not bad for a quick explanation; however, in our humble opinion, using the dialysis example given that CMS is discouraging payment for dialysis transports probably wasn’t the best choice. Below the explanation, is an expandable area labeled “Costs” which briefly explains to the patient that he/she must pay 20% of the Medicare-approved amount and also warns the user that a Part B deductible may apply. Additionally, the area contains a type of warning statement noting that doctors or other health care providers may recommend services more often than Medicare covers and informs the user that the beneficiary may wind up paying for some services outside of coverage. Recommendations are included to encourage the beneficiary to ask questions and/or explore other payment options. The app also reminds that the patient may ask the service provider what the charges for the service will be in the end. We like this, but it may be a bit far down to be seen if the patient chooses not to scroll through to the bottom. ← Influenza. The Ambulance. Documentation.